Above price based on bulk package: 100pcs/plastic bag, 4000pcs/case. Above price include shipping by DHL/UPS to these countries: America, Canada, UK, Germany, Belgium, Nerthland, Luxembourg, Austria, Sweden, Switherland, France, Italy, Norway, Spain, Denmark, Finland, Portugal, Greece, Ireland, Australia, New Zealand, Singapore, other countries kindly contact us for exact price. Funny laser finger beams(Led flashing finger light), with a very bright Led light and an elastic band attached to fingers shining through the darkness of night. Use these toys all together and create an amazing light show while you dance, or use just one at a time for safety or fun. Value to who: distributors, retailers who interested to sell, end users who use for any party favor. Our laser fingers use super bright F5 LED lights. 3 times of general led lights. HuaYi Personalized LED Laser Fingers Beams shell will not drop off for its well welding effect. Following pictures from production department corner to show laser finger beams(be produced by injection)before assembling and packing. 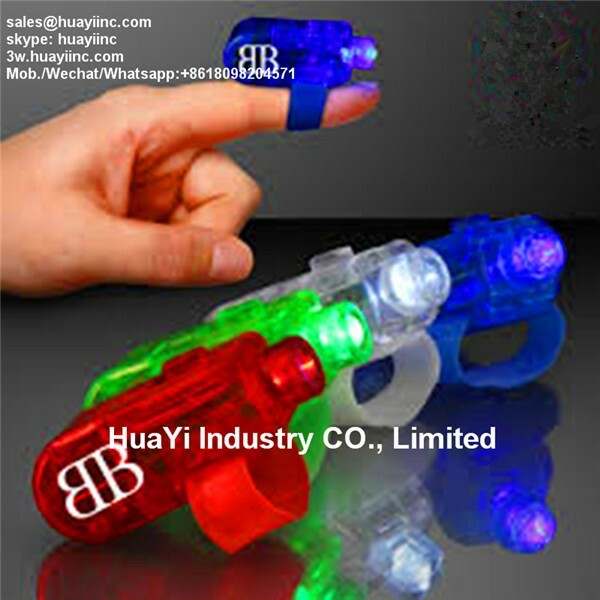 put these laser finger beams ring lamp on five fingers, shake your hands in darkness, it makes miraculous and unbelievable colorful laser beams. Develop new mold OEM for various styles of laser fingers welcome. product packing carton size chargeable weight G.W./N.W. Adjustable Personalized LED Laser Fingers Beams velcro strap conveniently fasten. Printing imprint logo for customer is available. Just promote your brand! With lovely design, it's great for lots of occasions, like a young people party, concert, public spot, a bar, or entertainment establishment and other public places, festivals like Christmas days, Halloween etc. 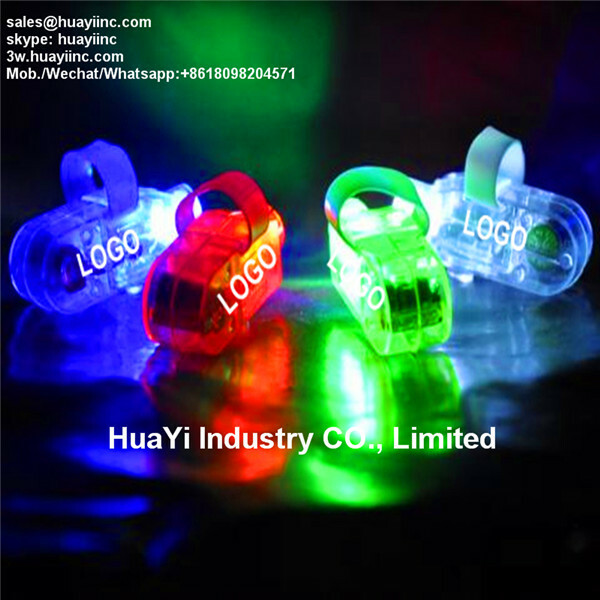 Customers can choose the 4 colors they like, if need custom other colors like purple, solid color, MOQ is 5000pcs, these Light Personalized LED Laser Fingers Beams with lowest price can be send in bulk package, individual packing and blister card package. Laser fingers could be printed with silk and heat transfer print your logos on toy body and full color printing on package. CDR and AI format format files with at least 300dpi needed. customers send AI, CDR, PSD, EPS. Also could produce fiber laser fingers, projection finger lights, elastic laser finger beams, velcro led laser fingers. Eco-friendly plastic raw material non-toxic non-odor and low mercury batteries, steady voltage. Our Personalized LED Laser Fingers Beams has authorized by CE Our product has authorized by CE and RoHS test system.